This last week I received a Subaru to test, a 2014 Outback with the four-cylinder engine and continuously variable transmission (CVT). It was the 2.5i “Limited” model in Satin White Pearl with Warm Ivory white leather interior. This car is made by Fuji Heavy Industries, a Japanese firm, with final assembly taking place in Lafayette, Indiana. It is sold by Greeley Subaru, a division of Weld County Garage. The Limited is the top-line Outback, out of four models offered in both four-, and six-cylinder configurations. This one had an option package that included power moon roof, 440-watt, 9-speaker harman/kardon stereo with XM satellite radio, Bluetooth phone, backup camera (4.3” display), and Ipod/USB connections. This $2,041.00 package, plus $244.00 for “puddle lights”, and $438.00 for remote starter, brought the total M.S.R.P. to $32,770.00, including freight. 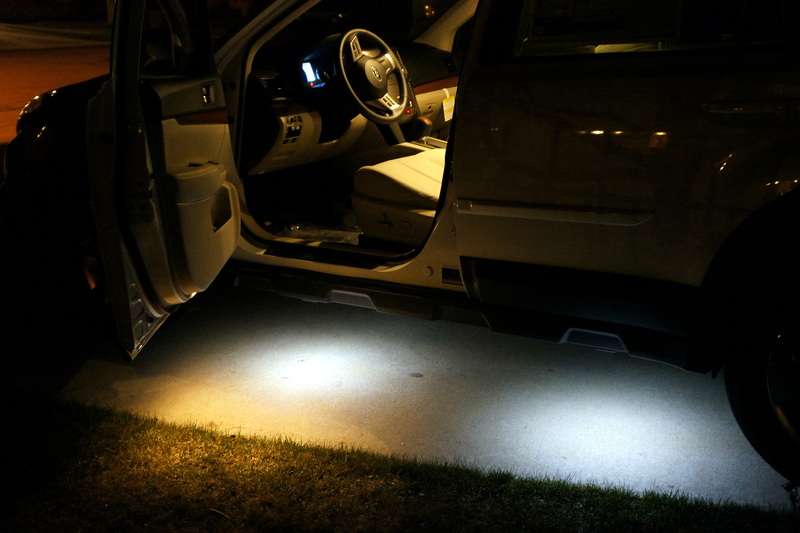 I really enjoyed the puddle lights that shine beneath each of the four doors on the vehicle, after dark. The Outback is a derivative of the Subaru Legacy wagon, introduced in 1994. It was originally called the “Legacy Outback”, and the Legacy name was dropped in 2003. Subaru in the 1990’s did not want to spend the money for a new design for its “crossover SUV” to be produced, so simply modified an existing offering. They added side body cladding, raised the ground clearance, and added a rugged-looking rack on the top. In 2009, the second generation Outback was introduced, and sales since then have been brisk – over 118,000 in 2013. 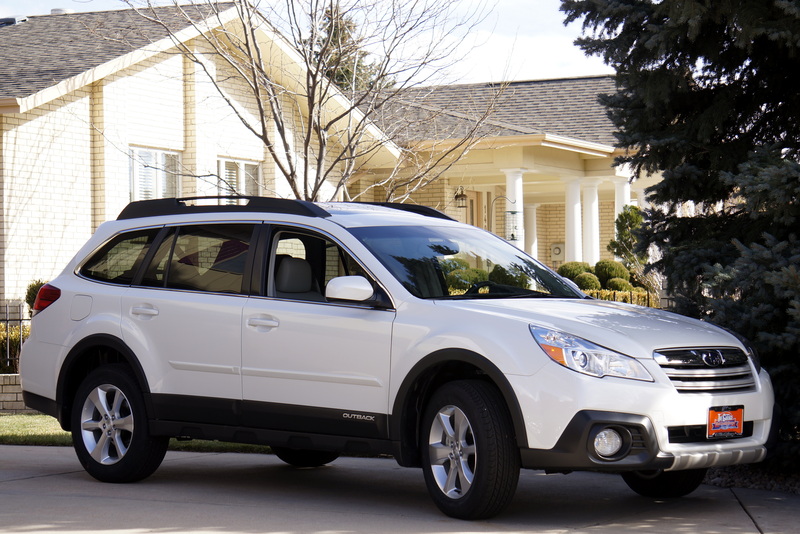 Crossover SUV’s are quite popular nowadays, and a large part it is the result of the Subaru Outback. Power for the Outback is supplied by a 2.5 liter, “boxer” four-cylinder, DOHC, all-aluminum engine with 173 horsepower and 174 lb. ft. of torque. The boxer designation refers to its horizontally-opposed configuration, like a Corvair or Porsche. Think of a boxer, throwing punches. The weight of the engine, although modest, is kept at a lower center-of-gravity with this design. Ground clearance, however, is a category-best 8.7 inches. The transmission is a Lineartronic continuously variable automatic with Hill Holder feature and six-speed manual mode – paddle shifters are behind the steering wheel. Symmetrical all-wheel drive, is, of course, standard equipment. Fuel economy is rated at 24-city and 30-highway for the car, and the fuel tank holds 18.5 gallons of regular gasoline. Acceleration from zero to sixty is reportedly 8.8 seconds. Wheelbase/length/weight are 107.9”, 189”, and 3,538 lbs., respectively, and the turning circle is 36.8’. The front leather buckets in the Outback are nice, and the three-passenger rear seat is split and reclines somewhat. Cargo space is 34 cubic feet with the back seats up and 71 cubic feet with the back seats dropped down. The center passenger in the rear has a shoulder belt, adding to the Outback safety reputation. Both of the front seats are power-adjustable, and the driver ergonomics are fine. I don’t think the Outback styling is its calling card, but I happen to like it, and Colorado residents do, as well. Subaru is the third-best selling automobile in the state, with about a 10% market share. The six-spoke 17” alloy wheels on the Limited are attractive, and they are surrounded by 225/60R17 Continental ProContact Gx all-season radials. The metallic white paint was offset with the dark cladding and bumpers, and the black roof rack gave the car an off-road look. I did not go off-road, but took some bumpy dirt roads with satisfactory results. I like the hefty, solid feel of the car both in town and out on the highway. A few days with the Subaru Outback, and this reviewer can see the reason that these Outbacks are so popular, particularly in our home state. Crossover shoppers would be well-advised to consider one at purchase time. The Beatles 1967 hit, “Getting Better” was one of the last songs created from scratch by John Lennon and Paul McCartney, and was included on the album “Sgt. Pepper’s Lonely Hearts Club Band”. Its production on March 23rd, 1967, had been delayed two days when Lennon mistakenly ingested LSD instead of an intended upper – something he typically did to get the recording work completed. Provenance of the song goes back to 1964 when session drummer Jimmy Nicol subbed for an ailing Ringo Starr on tour and when asked about his extreme case of nerves would reply that he was “getting better’. He made that response so often that it became a joke phrase amongst members of the biggest band in the world. The song’s lyrics include the line “I have to admit it’s getting better”, and relative to the Subaru Forester, I do. In the spring of 2011, I tested the then-current Forester, so therefore had a point of reference for analyzing this 2014 model. And I’ll have to admit, well, that this new Venetian Red Pearl Forester was impressive. Greeley Subaru, a division of Weld County Garage, loaned me such a car to test recently. It had an M.S.R.P. of $34,949.00, somewhat north of thirty thousand dollars just like the Subaru that I drove three years ago. This 2014 Forester had a base of $32,995.00 with mirror and protection packages for $1,129.00 and freight charges of $825.00. 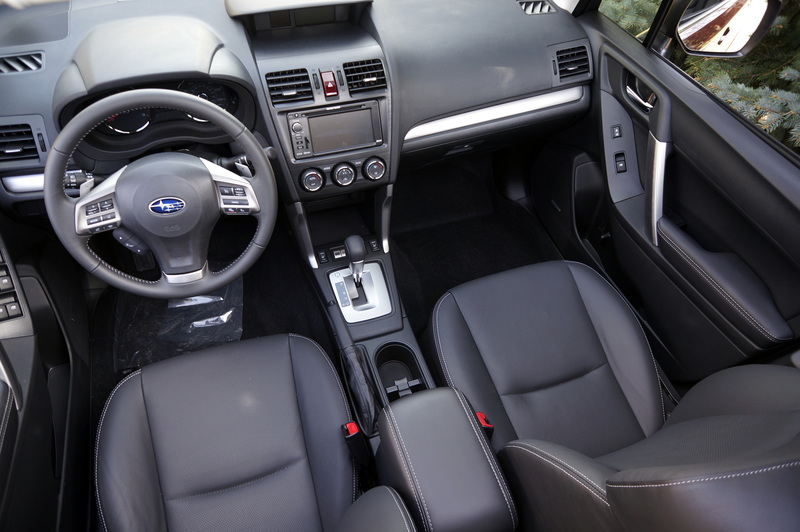 Standard on the Touring Forester was dual zone climate control, GPS navigation (6.1” screen), satellite radio, Harman/kardon 440 watt stereo, Bluetooth technology, 10-way power driver bucket, heated front seats, power windows/locks/mirrors/tailgate, power moon roof, tilt/telescope, and black leather upholstery. Subaru sedans and SUV’s all have “boxer”, horizontally opposed engines, and this one was a four cylinder, 2.0 liter turbocharged model with 250 horsepower and 258 lb. ft. of torque. The all-wheel drive power train obtained its motion through a Lineartronic CVT transmission – another superb one with manual eight-speed operation like other Subarus have. X-Mode is included on the XT, enhancing engine, transmission, and traction control functions. Fuel economy ratings for the Subaru are 23 and 28, with a combined rating of 25. Zero to sixty acceleration of this vehicle is reportedly 7 seconds with a top speed of 120 mph. 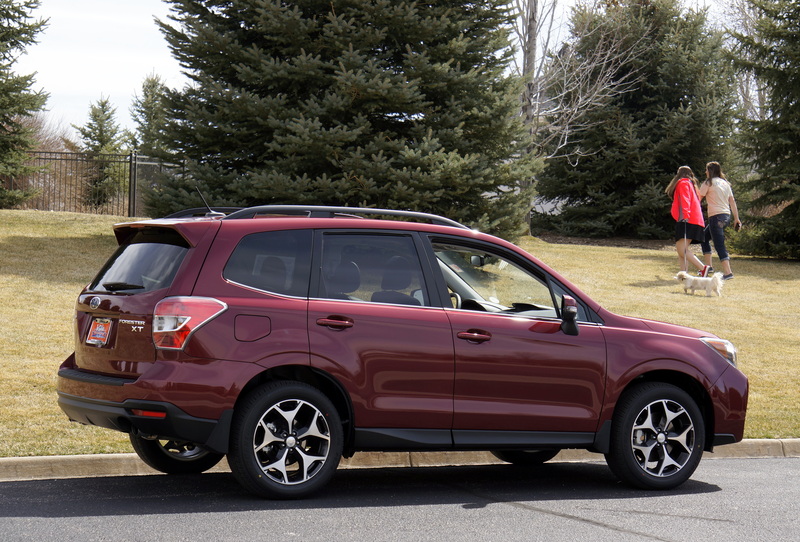 Handling and guidance of the Forester was an improvement over the 2011 model. 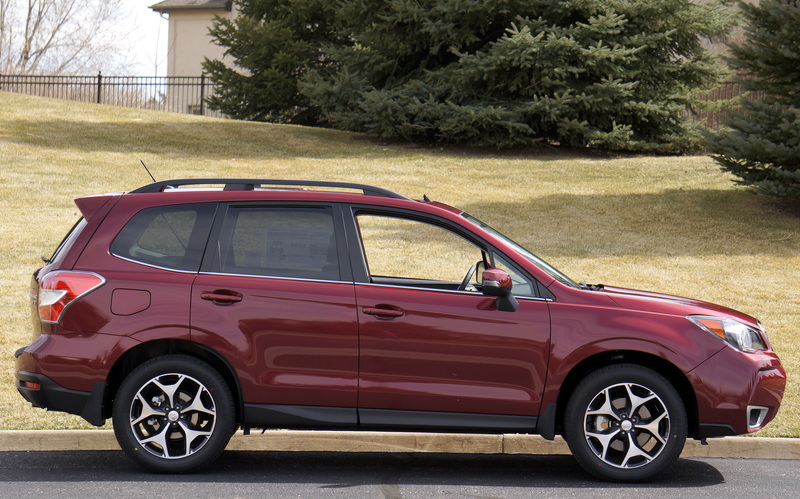 Styling of the 2014 Forester was slightly updated and aerodynamics are improved as is cargo space inside the five passenger vehicle. Wheels are 18” ten-spoke alloys fitted with Bridgestone 225/55R18 Dueler H/L 400 all season radials. Weight comes in at 3,651 lbs., length is 180.9”, width is 70.7”, height is 68.4”, and ground clearance is 8.7”. I enjoyed testing the new 2014 Forester and feel the company has managed to improve a top seller (123,592 in 2013). Regarding the 2011/2012 model, it’s a good thing that Subaru didn’t “Let it Be”.